Product code: ES8372 Categories: Antique, Antique Engagement Rings, Antique Rings, Art Deco, Art Deco Rings & Art Deco Engagement Rings. Early Australian jewellery is becoming so sought after, and here is a lovely antique green garnet and diamond ring by Levinson in the early 1900’s. Hand made in 18 carat yellow and white gold, in the centre is a incredibly vibrant natural green tsavorite garnet that measures 0.30 carats. Garnets are more commonly found in a deep rich burgundy-red colour, however unbeknownst to many people, garnets naturally come in an array of colours such as purple, orange and of course green as can be seen here. Surrounding the garnet are nine European cut diamonds that total 0.72 carats and encircle the garnet so beautifully and highlight the ring as a whole perfectly. This top cluster section measures 10.7mm in diameter and sits so well on the finger. Looking at the ring from the side shows such beautiful detail that went into hand making this ring all those years ago as does the elegant hand carving on the shoulders. Perfect for any finger and any occasion, this lovely antique ring will always be admired and loved. Tag: Antique garnet and diamond ring. 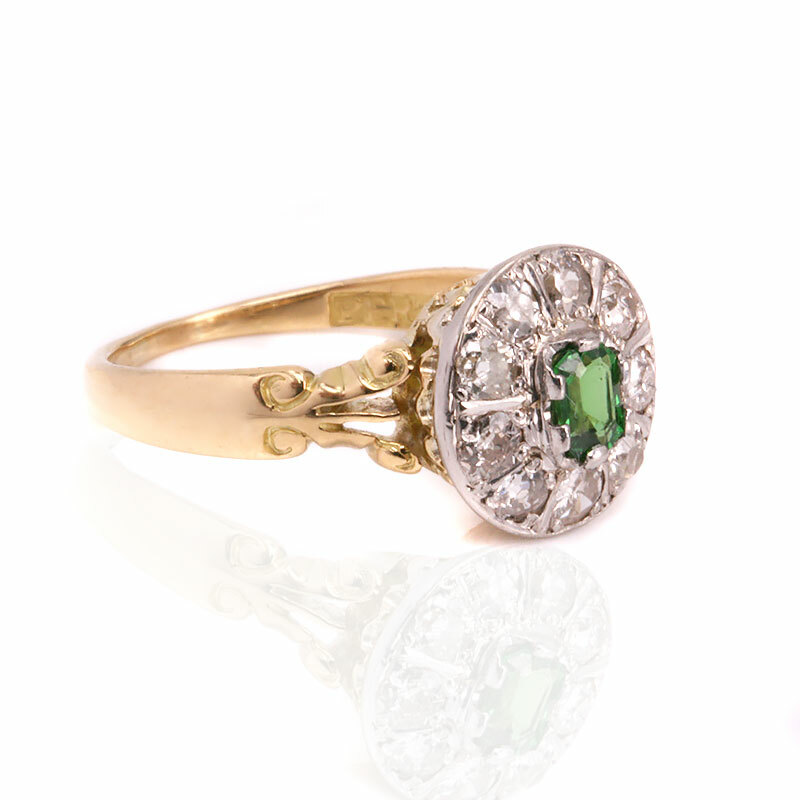 Set with a green tsavorite garnet and surrounded by nine antique European cut diamonds. Hyman Levinson migrated from the UK to Ballarat Victoria, and opened a jewellery business in 1854 until moving to Perth in the 1890’s. In 1896 his brother Mark Levinson opened his store in Howick St, and then later moved to a larger premises in Barrack St. In 1901 his sons Eugene and Felix became partners where they traded as Levinson & Sons where they became known for their high quality jewellery. In 1926 with Eugene’s sons Malcolm and Robert, they moved to larger premises to expand their jewellery manufacturing as well as jewellery and watchmaking repairs. When World War Two started they became involved in manufacturing optical munitions. In 1961 Caris Bros purchased Levinson’s and kept hold of many of the original staff as well as retaining Robert Levinson as a consultant.